Shii is a species of beech in the southern half of Japan, an evergreen which grows higher than 80 feet. 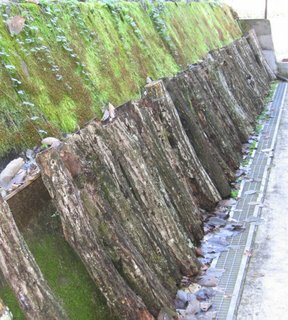 Shii logs are used to plant shiitake mushrooms, also known for the odor when their long white ears, dense with tiny flowers bloom without being seen, in the beginning of May. Read about our experience ! Many people grow them in the backyard, in a dark and moist place. The implants take about two years to grow and can be harvested in Autumn and early spring. This king of plantation has started during the Edo period. Since the harvest is usually plenty, we dry them for further use or freeze them. Soup made from freshly harvested shiitake does not need any water, they will provide all the necessary liquid for a delicious healthy broth. Click HERE to see some more photos ! The shiitake (Lentinula edodes) is an edible mushroom native to East Asia. It is generally known in the English-speaking world by its Japanese name, shiitake ( lit. "shii mushroom," from the Japanese name of the tree that provides the dead logs on which it is typically cultivated). In Chinese, it is called xiānggū (香菇, lit. "fragrant mushroom" or "delicious mushroom"). 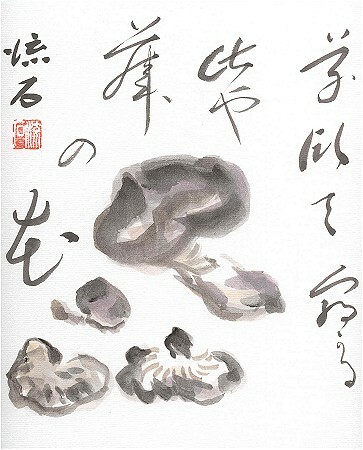 Two Chinese variant names for high grades of shiitake are dōnggū (Chinese: 冬菇, "winter mushroom") and huāgū (花菇, "flower mushroom," which has a flower-like cracking pattern on the mushroom's upper surface); both are produced at colder temperatures. Other names by which the mushroom is known in English include Chinese black mushroom and black forest mushroom. In Korean it is called pyogo ( hanja: 瓢菰), and in Thai they are called hed hom (เห็ดหอม, "fragrant mushroom"). The species was formerly known as Lentinus edodes and Agaricus edodes. The latter name was first applied by the English botanist Miles Joseph Berkeley in 1878. This mushroom is native to China, and has been cultivated for over 1000 years. The first written record of shiitake cultivation can be traced to Wu Sang Kwuang, born during the Song Dynasty (960-1127 A.D.). However, some documents record the uncultivated mushroom being eaten as early as 199 A.D.
During the Ming Dynasty (1368-1644 A.D.), physician Wu Juei wrote that the mushroom could be used not only as a food but was taken as a remedy for upper respiratory diseases, poor blood circulation, liver trouble, exhaustion and weakness, and to boost qi, or life energy. It was also believed to prevent premature aging. the heat of the sun. Dogen: How old are you? Dogen: Wow, you're old! Why don't you get an assistant to dry the mushrooms? Tenzo: Other people are not me. Dogen: But why do this now when the sun is so hot? Tenzo: (smiling) If not now, when? Later, Dogen was staying on a ship. He met a tenzo who came aboard to buy shiitakes. Dogen: Your monastery is far away. Please stay and let me offer you a meal. tomorrow's meal, it won't go well. Dogen: But surely someone else in the monastery knows how to cook? Tenzo2: This is my practice. How can I leave to others what I should do myself? 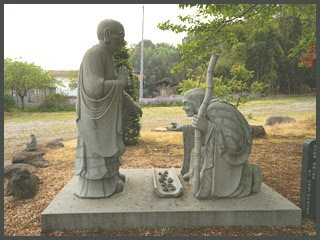 Dogen: Venerable sir, why work as a cook in your old age? Why not meditate and study the koans. Tenzo2: Hahahaha! My foreign friend, it seems you don't really understand practice. The monk left for his temple immediately. Two months later, the tenzo and Dogen met again. Tenzo2: One, two, three, four, five. Dogen (scratching his head): What is practice? Tenzo2: Everywhere, nothing is hidden. © Haiga by Susumu Takiguchi "floating stone"